* Produce a fast and very smooth animation and yet a very small published file size. 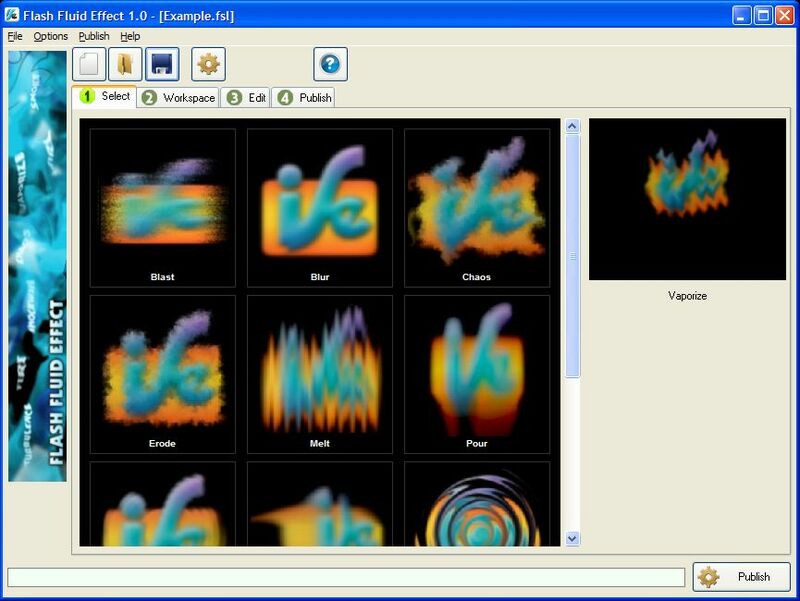 * Customize each effect by simply adjusting parameters such as effect size, speed, noise, etc. * Export into a flash SWF file. * Use a transparent background to easily overlay the published SWF on top of another SWF. * Overlay the animation with a background image. * Support bitmap transparency/alpha channel. Qweas is providing links to Flash Fluid Effect 1.25 as a courtesy, and makes no representations regarding Flash Fluid Effect or any other applications or any information related thereto. Any questions, complaints or claims regarding this application Flash Fluid Effect 1.25 must be directed to the appropriate software vendor. You may click the publisher link of Flash Fluid Effect on the top of this page to get more details about the vendor.